Remember how I said in my intro video that I’m no longer the crazy traumatised earthquake woman? How I’d moved on from that and no longer felt anxious about earthquakes? Well, I lied. 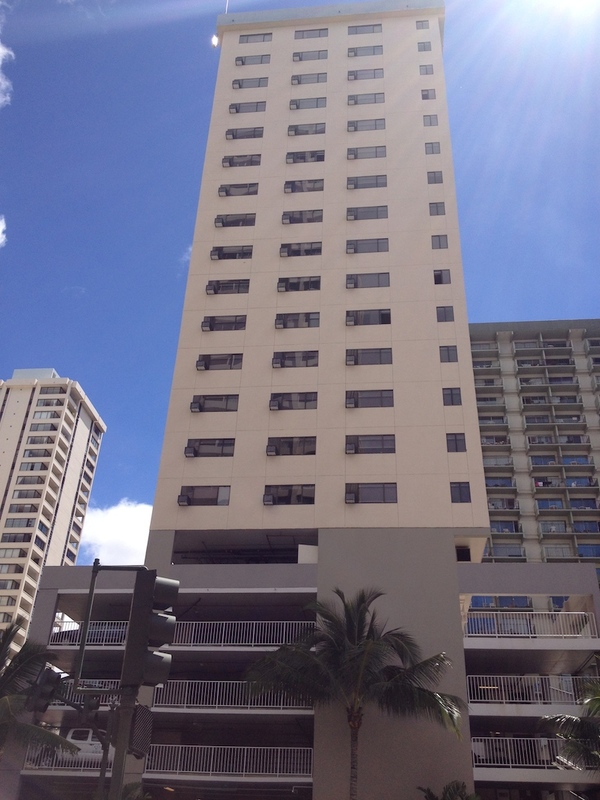 I’m currently staying in a high-rise hotel in Hawaii that has a bit of a CTV-building look to it. At least, it looks to be of a similar vintage to the CTV building. The CTV building was finished in 1986 and this hotel looks about the same age maybe older. I’m no structural engineer but the outside of the hotel does not inspire confidence. If there are any structural engineers reading this then feel free to reassure me 🙂 The CTV building became a coffin for 115 people during a 6.3 magnitude aftershock in Christchurch. I asked the people in reception whether the building had been earthquake-strengthened and got a blank look in response which probably means no. Hawaii – Honolulu to be specific – is not what I was expecting. I wasn’t expecting it to be so built-up. Indeed I was surprised to see all the high-rise buildings. It’s got more of a Gold Coast feel to it than a Sunshine Coast. The Gold Coast, which is south-east of Brisbane, is very developed and filled with high-rise buildings. By comparison, the Sunshine Coast, which is north-east of Brisbane, has more of a holiday feel. It doesn’t really feel like a city at all and so you get the sense that you have escaped from the big smog to somewhere quieter and more peaceful. Honolulu is really just a big city. I didn’t end up bawling my eyes out on the plane. In fact, I only shed a tear once and this was because I watched a fascinating film called Tracks. It’s the true story of an Australian woman – Robyn Davidson – who walked from Alice Springs all the way to the Indian Ocean with just a dog and three camels. It was a 1700 mile journey through harsh desert. Quite a remarkable story. The sad bit was (spoiler alert) that part-way through the journey her dog died. If I’d known the dog was going to die I wouldn’t have watched it. This is a tale of woe, this is a tale of sorrow, a love denied, a love restored to live beyond tomorrow. Lest we think silence is the place to hide a heavy heart, remember to love and be loved is life itself, without which we are naught. Posted in Travel and tagged beach, CTV, earthquakes, Hawaii, Honolulu, Tracks, travel. Bookmark the permalink. I hope you can relax and enjoy Hawaii. I’ve never been there, but like you, I imagine the flora and coast, not high-rise buildings. I love that quote! Thanks, Susie. I know what you mean about the streetscapes. There’s lots of lovely landscaping, especially on the shore-front. It’s definitely a nice place and I can see why so many people holiday here. It’s not a place I’d choose to go on holiday though because I’m not into beaches and shopping. BTW if you have time you might want to visit Doris Duke’s museum of Islamic Art in Honolulu (http://www.shangrilahawaii.org). We were keen to visit but unfortunately it was booked out. Next time, I’ll book ahead. Dickens had a fascinatingly awful relationship with women. He reminds me of one of his own characters sometimes: in Bleak House there is a mother who is always writing earnest letters to great people campaigning for social change, but completely neglects her own daughter. And Dickens was clearly outraged at the mistreatment of the unempowered classes, yet took advantage of the repressive laws against women at that time to send his wife away when he was was tired of her and deny her access to her children. I love the idea of the sea being warm enough to swim in. You have to be very brave to do that here. I didn’t realise Charles Dickens treated women poorly. It doesn’t come across that way in the film. In the film his intentions are honourable but he has become estranged from his wife and falls in love with the young woman. I dipped my toes into the North Sea at St Andrews when we were there last July and it was *freezing*.